I wish everyone could go on a Courts for Kids trip. I wish everyone would take time oﬀ just from their day to day life and put themselves in the position to work with people and not for them. 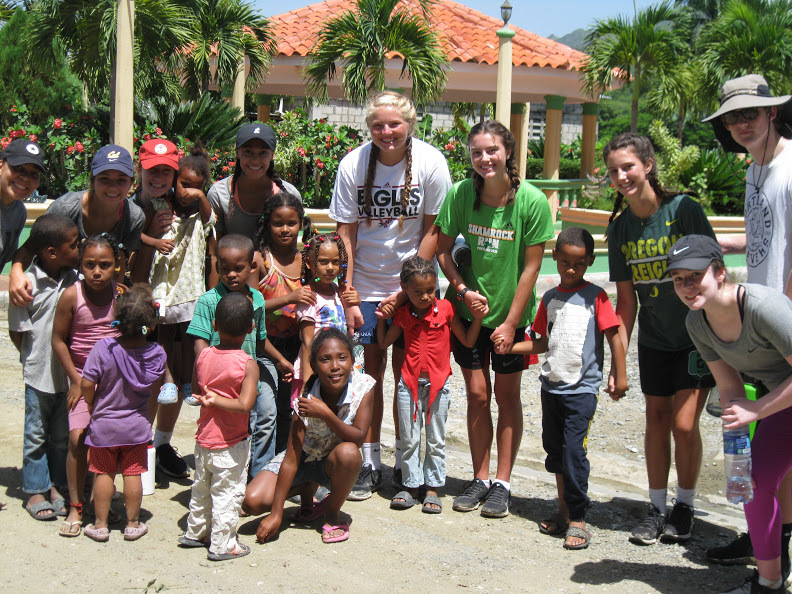 I wish everyone could have the true immersion experience because there really aren’t words that could even come close to describe my time in La Jagua, Dominican Republic. 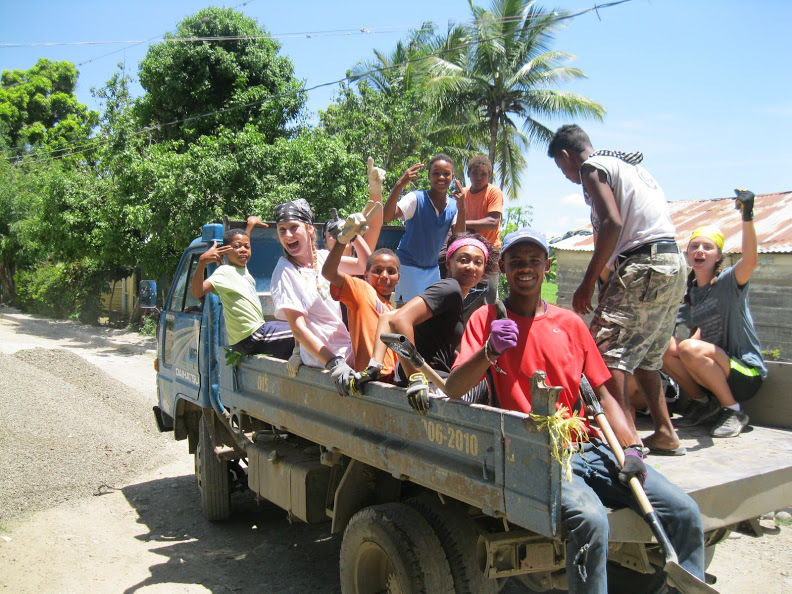 When we got oﬀ the plane in Santo Domingo, we met Natalie, our trip leader. I vividly remember her telling us that there was going to be an adjustment period with the community because of many things. There was the prominent language barrier, two diﬀerent cultures merging, and just plain nerves. 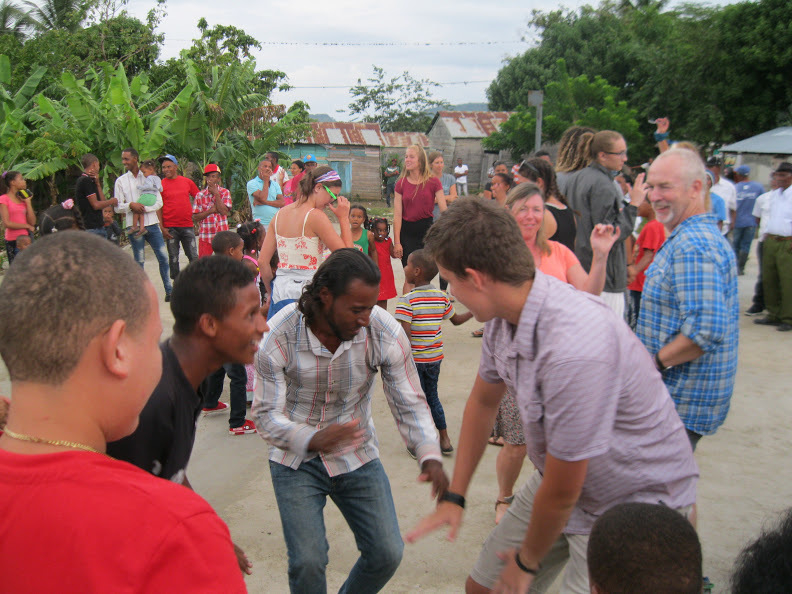 But when we got oﬀ the bus and were greeted by smiles and welcome signs and singing, there was no adjusting necessary. I was instantly comfortable with the community. The warmth and sense of family that poured from them was unparalleled. They really didn’t know who we were and where we came from and our backgrounds, they just saw people. People who they welcomed with open arms with all the love they could give. We were challenged while we were there. 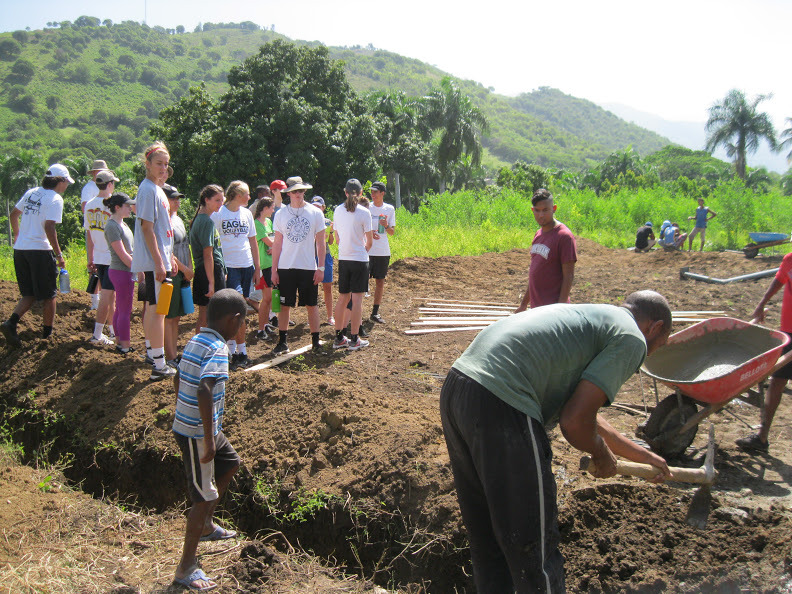 The obvious is physically, we shoveled for hours on end in intense heat. 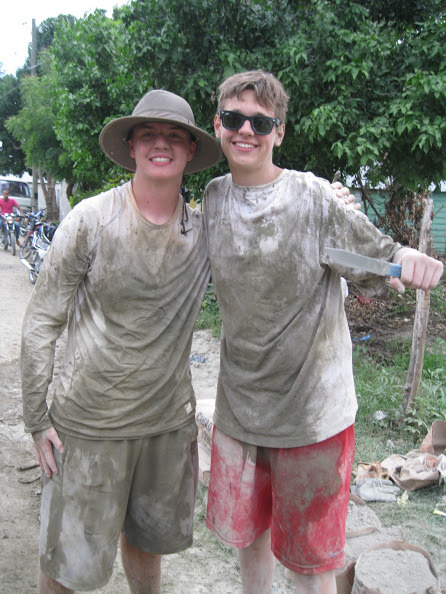 We got unrecognizably dirty between cement being sprayed on us and the mounds of dirt that were being transported. I was sore for days and got the worst sunburn of my life. We were also challenged in the way that we didn’t speak the same language, and, for once in our lives, speaking English was the minority. Two diﬀerent cultures are melting together, and it wasn’t easy in the beginning to do things a little diﬀerently. But diﬀerent doesn’t mean wrong. But in the midst of being out of our element completely, we learned. We learned so much more than we probably gave. It’s hard to explain those lessons unless you were there. Unless you witnessed the three hour dance party celebration or bathed in a river for ten days with several other people, you wouldn’t quite get it. Unless you went running knee deep in mud during a rain storm to get a stuck car out of the mud and not caring about how ridiculously dirty we got, it probably doesn’t make sense to you. It’s hard to really grasp unless you were there making bracelets for hours on end with all the little kids you inevitably fall in love with. The lessons they taught us were completely selﬂess and raw. 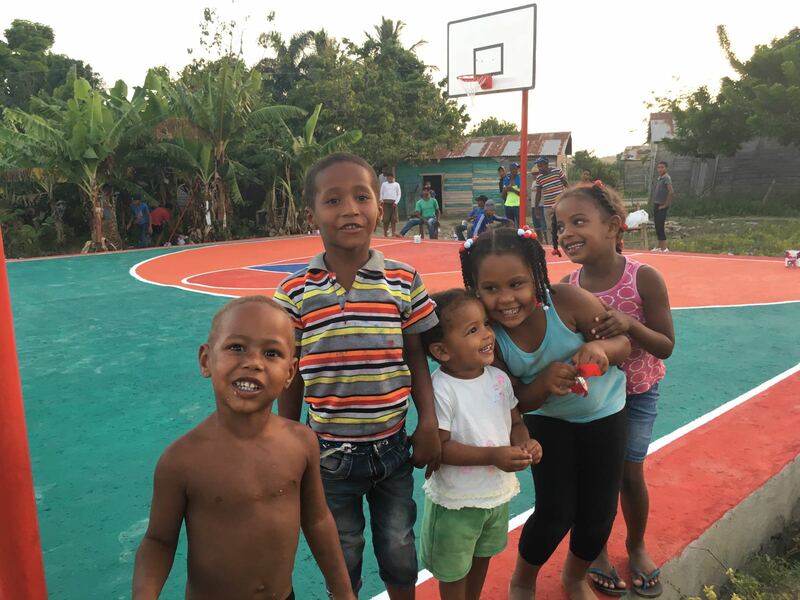 The people of La Jagua are considered impoverished, so it makes sense that you would think that they don’t have much to give. But they have so much to give. An abundance of acceptance, love and selﬂessness. And amidst their poverty, they are rich in spirit and hope. They do have a corrupt government and limited opportunities, despite the immense amount of potential each of them hold. It is no question that they face injustice everyday. It’s clear that they have to jump through hoops and overcome massive obstacles to reach frivolous things that, for us, are taken for granted. I think it’s important for us, as a privileged part of the world, to not do things for them, but rather work with them. Nothing will educate, defeat assumptions, and defy ignorance like living in solidarity with people who face injustice on a daily basis. We can then work together to create equality and opportunities. We have it within ourselves to create a more just world. We can’t do it alone. It’s not easy and, frankly, why would it be? The oppressive system that works against marginalized communities seems like an impossible task. But I believe that organizations like Courts for Kids can, and will, open up eyes and be an avenue to create the diﬀerence we need to see in the world. You see ﬁrsthand that giving to people will not solve the problem long term, but immersing yourself with them will. It not only gave me a life changing, unforgettable ten days, it gave not only a glimpse into the harsh realities of some people’s lives, but we lived in it with them. And I think it was one of the most important things I have done in my entire life. 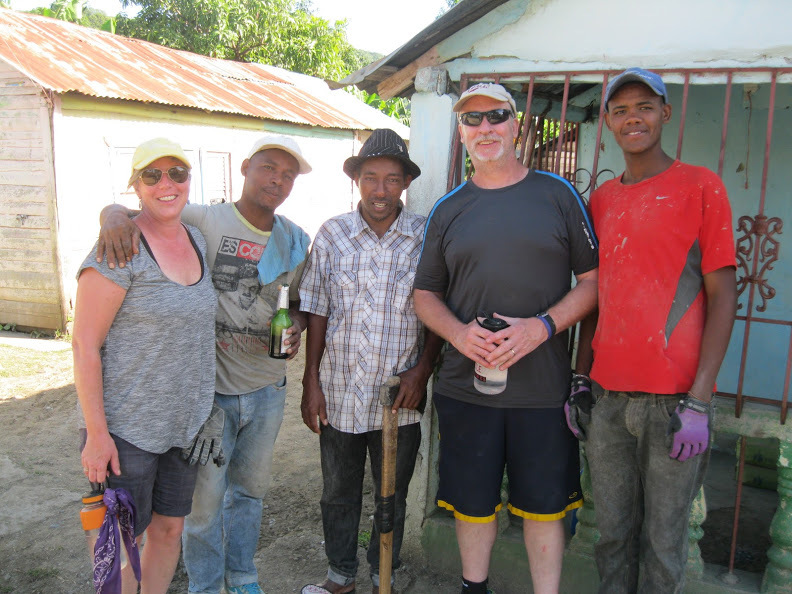 When we first boarded the plane on our way to the Dominican Republic, I was scared— and my inherent tendency is to render myself passive and turn inward. 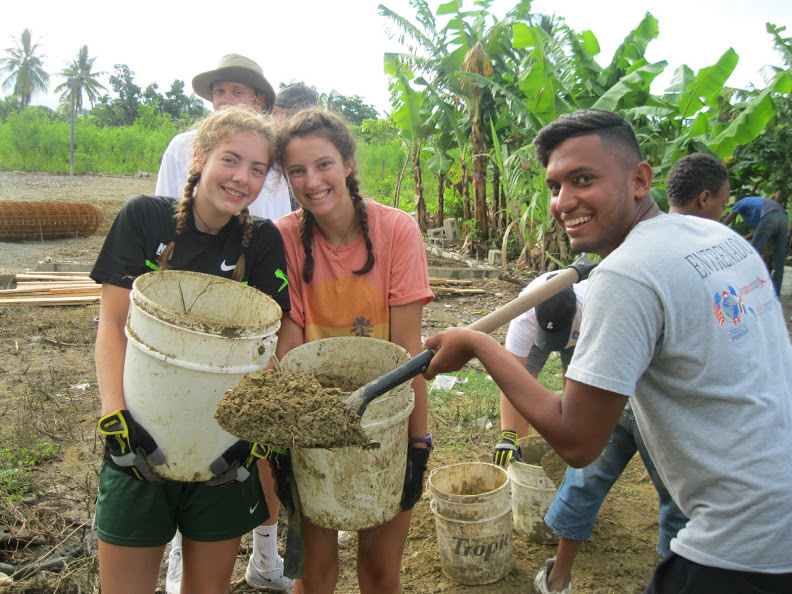 However, stepping off the bus in La Juaga, confronting the humid air, and seeing members of the community who had been waiting for hours, I began to sense the presence of a theme which later would prove to be pervasive- a threshold. On a literal scale, I was stepping off of a bus, but more metaphorically, I was entering an experience. One that would change my life. I learned fast that turning inward and staying comfortable limits the impact of one’s service. 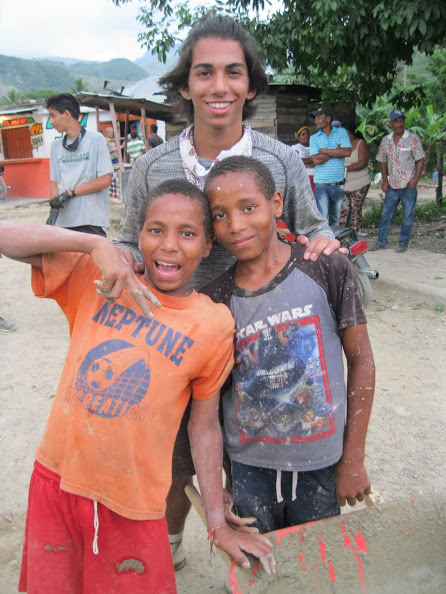 Community is of paramount importance to the people of La Juaga, and there is no room for selfishness or narcissism within community. A quote in our Journals reads, “there is a community of the spirit, join it and feel the delight of walking in the noisy street and being the noise” by Rumi, which is a more poetic way of saying “jump.” Just jump in. It was hard. I’m not going to lie. My back ached for weeks and I still have bruises painted on my skin. 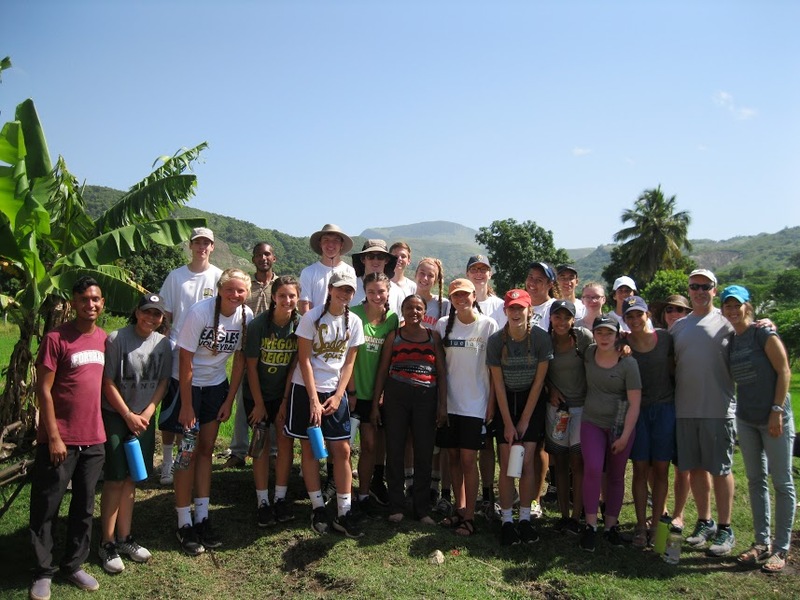 Even though the work is what left physical marks on my body, it is never the first thing I bring up when someone asks me about the trip. But what I have found is that there is no way to describe our immersion. No one quite understands the feeling of the sun beating down while sweat drips off their face and their back is on the verge of collapsing, all while three kids are climbing on them and wanting to play tag. I cannot describe the way authentic Dominican food tastes after a long day. Words like “fun” or “special” do no justice to my experience. So, in an attempt to help people understand the trip when they ask, I just tell them to go. Go live in community with impoverished people. Don’t try and fix their problems, just learn in order to understand them. Go get educated about their complex history. Go. Go connect with people of a different race or religion. Go create bonds that last far longer than just ten days. Go build something that improves lives. Go leave the comfort zone, walk through that threshold, just jump. Go be the noise. My specific trip was led by Natalie and two chaperones from my school. However, the true leadership came from within the community. Their ingenuity and tenacity not only inspired me, but it was also imperative to the end goal: to build, and finish, a multi-sport court. Every morning, they were there before us and every night they stayed after to continue their work. Fran and his twin Frańce (11 years old) were the two hardest working people helping with the court. They both dream of one day becoming engineers – it’s a big dream, but if anyone could handle it, it’s them. While reflecting one night, one of my peers explained the twins goals, and immediately the mood dropped. In that moment it became apparent of our different realities. 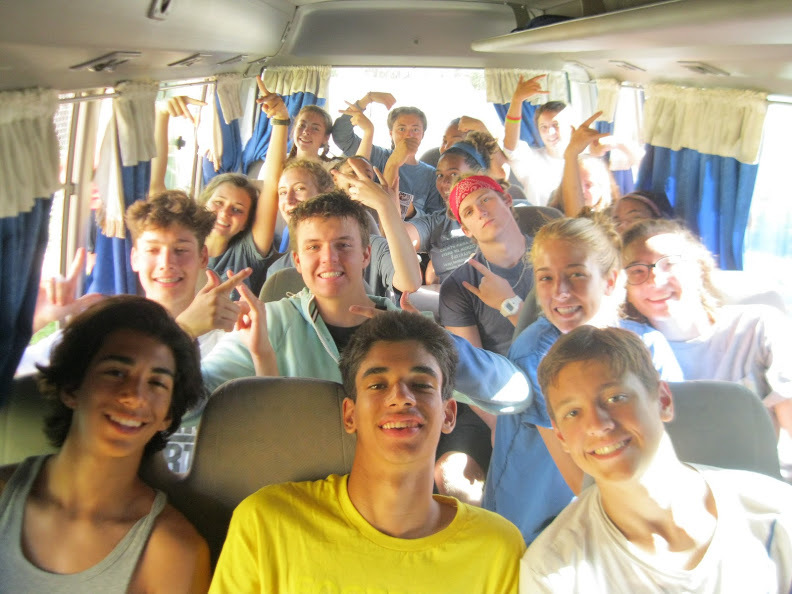 Most, if not all of my peers that went on the trip, are in a position to attend further schooling after high school; however, in La Juaga, this is not the case. While we were there, injustice seemed to be right there. Almost as if you could reach out and touch it. A sense of guilt loomed in me. I have lived with such luxury all my life, always conscience of poverty but never educated about it or how it comes about. When I came home, I realized that injustice is still right there. Injustice does not live on an island. Poverty does not live on an island. Similarly, the love and happiness I felt does not live on that island. I will hold on to that feeling forever. The feeling of home. Now, back in Portland, I feel that I have a heightened sense of that injustice. It is my responsibility to educate my family and friends, and teach them about what poverty looks like, and help them to understand that they don’t have to travel far to see it. A new threshold. We are surrounded by that injustice. But we are also surrounded by love, by community, by hope. My experience changed my perspective of everything. Even a simple step out of a bus.